How Much Does Your Archive Weigh? I remember, in 1978, showing [Fuller] our Sainsbury Centre for the Visual Arts and being startled when he asked: “How much does your building weigh?” The question was far from rhetorical. He was challenging us to discover how efficient it was; to identify how many tones of material enclosed what volume. 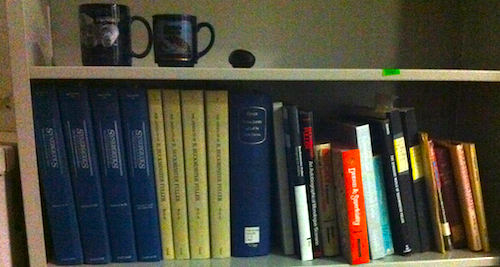 The Synchronofile is now the largest private collection of Buckminster Fuller literature. 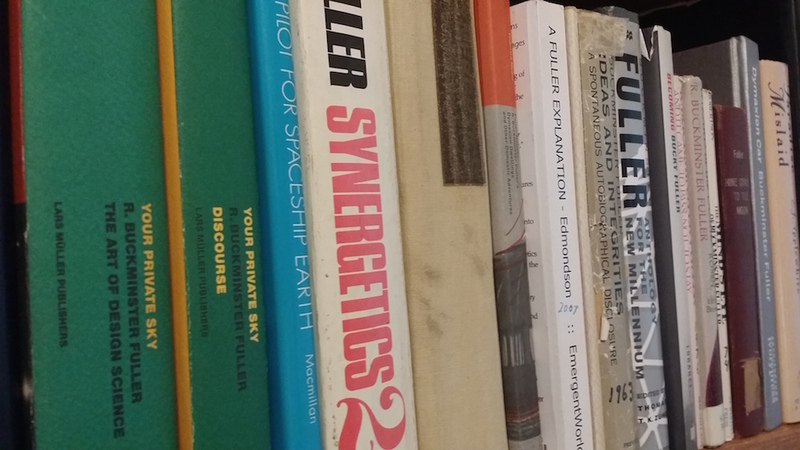 In March 2013, Joe Moore of the Buckminster Fuller Virtual Institute donated his collection of Fuller papers to the synchronofile. 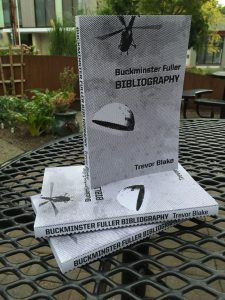 Combined with the papers already owned by Trevor Blake, the synchronofile is now measured in tons of literature by and about R. Buckminster Fuller. An archive is rightly measured for its content as much as its volume, but access to this amount of material is significant. As I wrote in my 2008 Buckminster Fuller Biblography: “The pioneering work of Joe Moore and the Buckminster Fuller Virtual Institute were my first guide to what Fuller on the internet might look like. Joe’s work is the standard I have attempted to best, it includes a superabundance of information not found here and I will always be in admiration of it.” I first saw Joe’s work on usenet at bit.listserv.geodesic, before the popularity of the Web. Joe has always been first to answer a question on Fuller, first to publish information electronically, first to encourage further original research. My Biblography was already twice the size of the nearest equivalent. In the months and years to follow, Joe’s archive will be incorporated into my own and the Biblography will expand. The synchronofile is available for viewing by appointment. I will be delivering a new version of my one-hour lecture The Approximately Omnidirectional Ephemeralization of Richard Buckminster Fuller this weekend in Portland, Oregon. When: 6pm Sunday 30 November 2008. Where: Portland Center Stage, 128 NW Eleventh Avenue, Portland, Oregon. Cost: Free! (but buy a ticket and stay for the play after my lecture). Immediately after my lecture is a performance of R. Buckminster Fuller: THE HISTORY (and Mystery) OF THE UNIVERSE. I have seen this play several times and this production several times. I encourage everyone to please see this play! Coming up on Monday, 10 November 2008 in the Ellyn Bye Studio: DYMAXION PORTLAND. A conversation about regional resources with David Bragdon (Metro), John Haines (Mercy Corps NW), Jill Fuglister (Coalition for a Livable Future) and Lawrence Wallack (PSU’s College of Urban and Public Affairs). Join some of Portland’s leading thinkers and policy-makers for a discussion on the region’s “Spaceship Earth” challenges (like open spaces and environmental stewardship, renewable energy population growth, equity, sustainable development, climate change, hunger and affordable/adequate shelter). 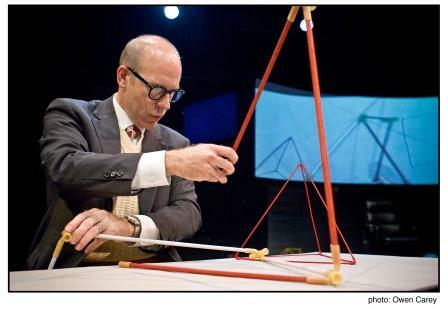 Presented in conjunction with Portland Center Stage‘s production of R. Buckminster Fuller: THE HISTORY (and Mystery) OF THE UNIVERSE. 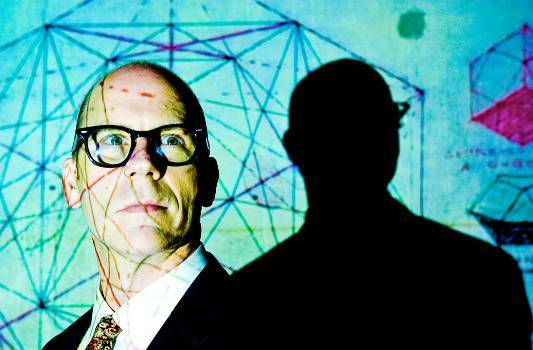 Portland Center Stage is presenting R. Buckminster Fuller: THE HISTORY (and Mystery) OF THE UNIVERSE written and directed by D. W. Jacobs from the life work and writings of R. Buckminster Fuller. The play will run from October to December 2008. I had the good fortune to see this play in Seattle in 2001 and again in Portland on opening night in 2008. I cannot recommend it highly enough. This play is true to Bucky while being an engaging performance in itself. I will be speaking before the play on Sunday 30 November 2008. The following is from the PCS Web site, where tickets for the show are available for sale. Does humanity have the chance to endure successfully on planet Earth, and if so, how? This is the question framed by Buckminster Fuller, the engineer, designer, poet, and philosopher who, among other things, was Mensa’s second president and invented the geodesic dome. Join us for an unforgettable journey inside one of the most remarkable minds of the 20th century in a one-man show that blends videos, lectures, poetry and a healthy dash of humanist humor. A hero of the sustainability movement, Bucky framed many of the great ideas of his time and ours. This is your chance to get to know the man behind the world-saving mission. [Also,] join us for a series of free panel presentations and informal discussions about Bucky’s design principles and what they mean to the future of Portland, featuring leaders of Portland’s design and sustainability communities.